Spending time and creating shared memories with children is one of summer’s many highlights. And if you’re looking for one last hurrah with your kids before they head back to school (or if you have little ones at home), check out this list of free museums. Not only do these museums offer free general admission, each one has robust family-friendly educational programs. While some activities, like summer camps or special attractions, can be fee-based, the majority are free. And if your kids are already in school, don’t worry. Each museum on our list provides educational programs and family-friendly art activities throughout the year. The museum’s Family Affair program provides various art-related activities and exhibition tours for families with children ages 12 and under on select Saturday afternoons. Bring your kids to this dynamic arts venue and enjoy interactive experiences in its art gallery, performing space, and community media center. 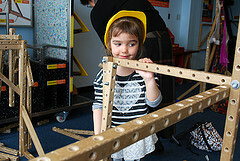 Families can drop in for museum tours and an eclectic mix of hands-on art activities, including collaborative sculpture-making, silkscreening, and costume construction. Multiple exhibits and attractions, including star gazing on Friday nights and digging for replica fossils, await the whole family. The museum’s Kenan-Flagler Family Discovery Gallery provides families with a dedicated space to enjoy both high- and low-tech exhibits that are entertaining and educational. Pick up your free Art to Go tote bags filled with various child-friendly activities that encourage reading, looking, and learning among the museum’s many galleries. Specific programs for children with autism are also provided. The museum’s own mascot, Bart the Bat, provides families with fun and educational art activities throughout the year, including watercolor painting, drumming, and dancing. Programs and features like Look and Learn with Hoot, Family Guide, and Family Corners are just a few ways this museum welcomes families with kids of all ages. Sitting on 40 acres, this museum includes multiple galleries, including an interactive space just for children. With two 19th-century living history farms, the museum will take you and your kids back in time to experience life in the 1800s. Children can learn about world cultures through the use of puzzles, sketching, and art-making. Download your free copy of Intersections: World Arts, Local Lives, the museum’s guide that ties its artifacts and exhibits to these fun and educational activities. 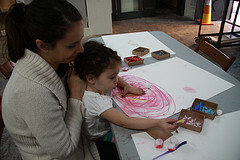 Family Art Saturday welcomes toddlers, kids, and tweens to the museum where they’ll make age-appropriate art projects that relate to a specific idea, medium, or theme. When it comes to spending time together and creating memories with your family, free museums are a wonderful resource to tap into! Do you have any free museums you’d like to tell us about? Let us know in our comments section. Parchmint, Inc. is a Wisconsin-based children’s product company dedicated to helping families create and preserve lasting memories and promoting child development through learning that’s fun. Learn more at parchmint.com. based outside of Dallas, Texas. You can follow her on Twitter @AmyLNeeley.